But just as I am sure that the cars that you drive influence you massively, the vehicles that we get to sample also make an impact on us. Whether that's a positive impact, a negative one - or simply a keeping of the status quo - all cars have that influence. And the two HSV Holden V8s that we recently drove have had a huge impact on our automotive thoughts and philosophies. Both the Clubsport R8 and the SV300 were made available by HSV in Queensland, and we thought it important enough to fly Dep Ed Michael Knowling up from his Adelaide base to drive them with me. 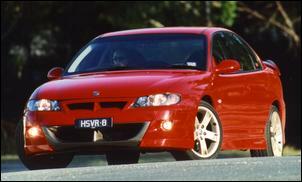 And by the time that you read this, we'll both have also driven the HSV Coupe (ie Monaro) GTO - in Melbourne, this time. And why do I consider that those cars are so important in helping to determine our automotive philosophies? Well, we thought that both big V8-powered Holdens were very, very good cars. With a ride/handling compromise that was scintillating (and remember, I said both ride and handling; not just one or the other), and with a driving cohesion that comes only from a vibrant and attuned engineering team, the two HSV products walked in very select company. 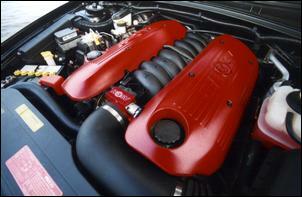 Like, we were mentioning them in the same breath as the Evo 6 Lancer, and the Supra Twin Turbo. That doesn't mean that we thought the HSV products the equal of those two brilliant cars, but they were in the ballpark, no question. And, simply, we never expected that level of on-road quality. Brute force, maybe. A bone-shaking ride where "good handling" really meant only huge grip levels from ultra-expensive sticky rubber trying to overcame archaic suspension designs. Tarted-up Commodores trading heavily on mistaken mystique. But instead of that, we thought that the cars were simply excellent. Some people have even asked if I'd have a current HSV over my '98 Lexus. The answer to that is 'no' - I like stability control (something that the HSV products should have, given their pricing) and the basic lowest-common-denominator build quality and equipment level of the Commodores still shows through clearly. And there's another reason I wouldn't have any of the HSV V8 cars. I have always monitored my cars' fuel consumptions. Not so much because I am worried about the dollars I pay for the petrol, but because I think that good engineering should result in fuel-efficient engines that develop excellent power while still using as little fuel as humanly possible. So turbo engines have previously been my favourite - cars that can do 0-100 km/h in the mid sixes and still get 10 litres/100 in normal use. And my current Lexus regularly gets 10 litres/100 - despite its 4-litre V8 configuration and ability to shift its 1700-odd kg to 100 in mid-sevens. Even in more demanding city and hill highway use, it will still turn in fuel economy figures in the twelves. On a freeway cruise? Mid eights! Compared with that, the V8 HSV and Holden products that we have been driving are absurdly, farcically, stupidly and outrageously poor in their fuel economy. Like, I wouldn't want to drive one because whenever I looked at the car with that warm glow that comes from having something you love, I would simultaneously feel angry at the quality of engineering that allows a car to consume petrol at a rate that has shown no improvement in thirty years. Hey - that's me, remember, so don't write in saying that you are happy with a guzzler. In fact, the cars' consumption was so bad that I really start to wonder about legislation. Oh hell, not banning these monsters with the drunkard's thirst, but penalising those that wish to use up the petrol that I'd like to be available in fifty or a hundred years' time. I mean, what about a petrol guzzler's tax, with that money earmarked specifically for R&D in areas of alternative propulsion? Or even more targeted, to be used to subsidize those performance cars that do the numbers without sucking the juice? I mean, an STi Impreza or Lancer Evo 6.5 would run away and hide from even the 400hp HSV SV300 - and at the same time use perhaps 30 per cent less fuel in doing so. On a cruise, those two turbo all-wheel drives would use half the fuel. And so produce something like half the emissions. 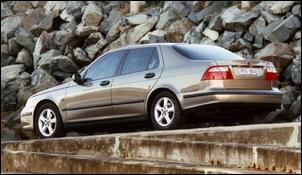 And then, these thoughts wafting through my mind, I drove the Saab 9-5 Arc on a 2300 kilometre long trip. As you'll have read, over that distance the car averaged 8.2 litres/100km - in much the same conditions as I achieved 15-16 litres/100 in the 300kW HSV. Oh sure, in a straightline drag the Saab (0-100 km/h in low nines) would be left behind. And oh, sure, in a street cred race the Saab wouldn't even show. Around a track? Take the SV300 without a doubt. 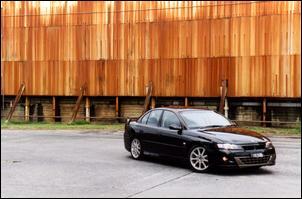 But in a real-life long distance drive, the difference between the Saab and the HSV would be minor. Like, if offered both, I honestly don't know which I would prefer... if a tanker truck was following along behind, anyway. Without the tanker, well, I'd take the Saab. And yes, that would still apply even in Australia's speed-limitless Northern Territory. You see, even when there are no radar-toting cops around, I doubt that I would sit on more than 160-170 km/h, and I am sure that the Saab would do that with ease. While using vastly less fuel. The V8 Holdens - HSVs included - show with startling clarity the absurdity of powering a vehicle with an engine mechanically sized to be able to develop the most power that you'll ever need. Without any 'variable' bits - variable cam timing, variable intake manifold, electronically variable throttle, variable aspiration - they are stuck with churning through fuel like it's still the Sixties. You open the throttle wide and the engine gulps down the fuel to develop what are probably reasonably good grams per kilowatt (ie specific fuel consumption) figures. But when you idle along, engine 90 or even 95 per cent throttled, the volumetric efficiency is (by definition) terrible, and the frictional drag of the huge engine relatively unchanged. The result? Even with lean-cruise engine management technology, simply woeful consumption. I have seen some people claiming excellent economy from the Gen III V8. However, I certainly didn't see it in any of the cars that we had. Real world, in fact they had the worse fuel consumption I have ever experienced from any car that I have driven. And don't bother telling me that they are big heavy cars with lots of performance. The Monaro CV8 that we drove had quite pedestrian performance (for its claimed power and actual engine size) and still sucked like an unweaned goat.